Now, more than 40 years later, the City is finally attempting to right this historical wrong and incentivize redevelopment on two major sites across from Riverfront Park. In particular, after a request from the Downtown Spokane Partnership and its members, the City is exploring increasing the height limits on certain parcels near the Looff Carousel in Riverfront Park. Between the Liberty Building lot and the Bennett Block lot, there are roughly 2.5 acres of developable space, and the possibility of mixed-use residential and retail space near Riverfront Park are, to say the least, tantalizing. Currently, these sites are capped at 100 feet, with additional height allowed only with 15-foot setbacks, in order to limit the amount of shade which falls on Riverfront Park. While this generally succeeds in limiting shading on the park, it can create challenges for mixed-use developers. The fewer stories a building can be, the fewer housing units it can contain. The fewer housing units it can contain, the less profit can be made per unit. The less profit made per unit, the less likely a bank will give financing to a project, and…well, you get the idea. Good urban design succeeds in balancing the public interest (in this case, a relatively shade-free South Bank of Riverfront Park) with the private interest (a developer’s ability to redevelop a site) in order to produce the most beneficial outcome for the City as a whole. That said, there may be a better balance than the current one, and the City is currently soliciting public feedback on options aimed at doing just that. For example, could taller towers be allowed on these sites, above the 100′ limit? How close together should the towers be? How much square footage should be allowed? The City has developed an in-depth explainer with easy-to-understand analysis located here. At the end of the explainer, viewers have the opportunity to share feedback on the potential designs. We encourage readers to explore the options and complete the survey. Redevelopment of these sites would be a major boost to downtown Spokane and the city as a whole, and we are excited by the possibility. We should think carefully about the options on the table before adjusting the subtle give-and-take of urban design too aggressively. But certainly a new balance can be found which adds a bit of additional incentive to redevelop these old parking lots and better connect with our city’s crown jewel in Riverfront Park. 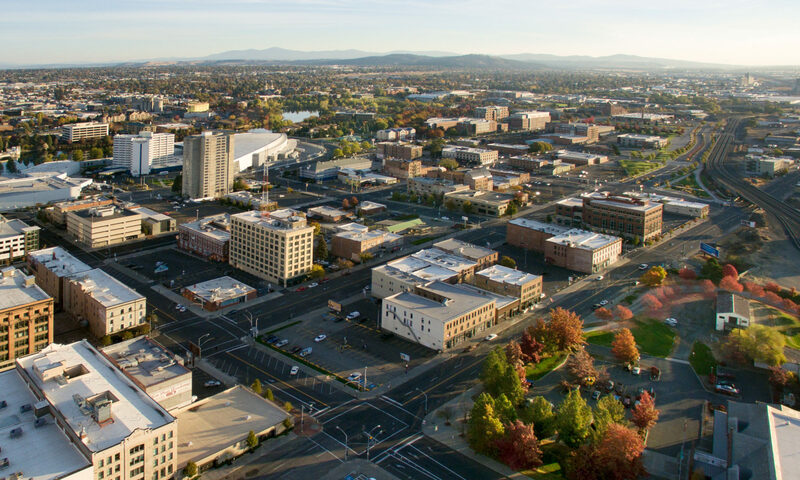 SHARE YOUR THOUGHTS: What do you think of the City taking significant steps at code reform in order to incentivize redevelopment along Spokane Falls Boulevard? Which options do you think best fit the area? And would you like to see more code reform in other areas of the City? Share your thoughts on Facebook, on Twitter, in the comments below, or in person. We love to hear from you!